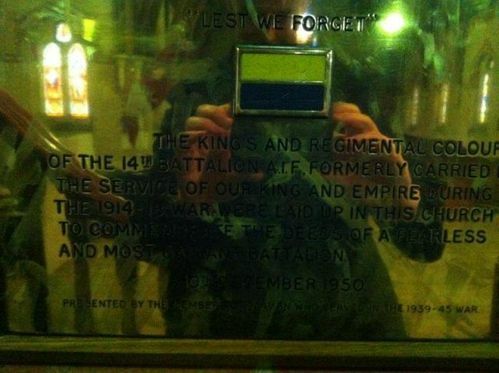 The Regimental Colours and plaque commemorate those of the 14th Infantry Battalion who served in World War One. The regimental colours, which were presented by the citizens of St Kilda, were originally consecrated in the church on 13th December 1914 and hung in the church during the first World War. They were then transferred to the St Kilda Town Hall. The colours were returned to the church in a ceremony in which the plaque was unveiled, on the 10th December 1950. The regimental colours which were presented by the citizens of St Kilda to the 14th Battalion of the 4th Infantry Brigade of the Australian Imperial Force, and had been consecrated by the chaplain, the Rev Andrew Gillison, MA , on the 13th of this month, were consigned on Sunday evening to the custody of the congregation of St George's East St Kilda, of which Mr Gillison is the minister. There was a very large congregation present, including the mayor and mayoress of St Kilda, and a detachment of the battalion. Mr Gillison accepted the charge of the colours in the name of the congregation. They will hang in the church till the battalion returns. Presented By The Members Of The 2/14th Bn Who Served In The 1939-45 War.